To Cite: Salehi A, Shahgholian N, Mortazavi M. Investigation of the Effects of Stepwise Sodium and Ultrafiltration Profile on Dialysis Adequacy, Crit Care Nurs J. 2016 ; 9(1):e5105. doi: 10.17795/ccn-5105. Background: One of the leading causes of disability and mortality among patients receiving hemodialysis (HD) is HD inadequacy. Enhancing HD adequacy can improve the prognosis for these patients. Objectives: This study sought to investigate the effects of stepwise sodium and ultrafiltration profile on HD adequacy. Patients and Methods: This crossover clinical trial was conducted on 30 patients, who were receiving HD in two HD centers, affiliated to Isfahan University of Medical Sciences, Isfahan, Iran. Each participant received HD in four routine HD sessions and four stepwise sodium and ultrafiltration profile sessions. Hemodialysis adequacy was calculated online by a software installed on the HD machines. The data were analyzed by conducting the paired-samples t test. Results: The mean of dialyzer urea clearance multiplied by time, divided by volume of distribution of urea (Kt/V) ratio in the routine HD and the stepwise sodium and ultrafiltration profile groups were 1.237 and 1.395, respectively. This difference was statistically significant (P < 0.05). Conclusions: Sodium and ultrafiltration profile maintain hemodynamic stability through adjusting sodium concentration and ultrafiltration and, therefore, they improve HD adequacy, as well as patients’ tolerance to HD. Consequently, replacing routine HD techniques with this technique is recommended. This study aimed to investigate the effects of stepwise sodium and ultrafiltration profile on dialysis adequacy. In this formula, S is an estimation of the standard deviation of the dependent variable (i.e. HD adequacy), z1 is confidence coefficient (which was considered to be 0.95%), z2 is the power of statistical tests (which was considered to be 80%) and d is the minimum significant difference of dialysis adequacy score between groups. The study participants had an age of eighteen or greater and were receiving HD biweekly, for more than 3 months-4 hours per session by using the sodium bicarbonate solution. Patients with acute heart failure were excluded (12, 14, 18-20). Sampling was done conveniently. Study participants were randomly assigned to two fifteen-person groups, after obtaining their consent and collecting data about their demographic characteristics. Patients in each of the groups received HD by using either of the following protocols: Protocol one: routine HD method and then stepwise sodium and ultrafiltration profile; Protocol two: stepwise sodium and ultrafiltration profile and then routine HD method. Each patient received HD by using the routine method for four sessions (20). The concentration of sodium in the dialysis solution was maintained at 138 mmol/L throughout each HD session and the ultrafiltration rate was kept unchanged. After these four sessions, the patients received four HD sessions, by using the stepwise sodium and ultrafiltration profile. At the beginning of these four sessions, the concentration of sodium in the dialysis solution was 146 mmol/L, which was decreased stepwise to reach 138 mmol/L, at the end of the session. The rate of ultrafiltration was also decreased automatically and stepwise proportionate to the sodium profile. In each session, patient and treatment-related data were entered into the HD machine, for calculating Kt/V. Accordingly, Kt/V value was automatically calculated by the machine and documented in a checklist. In this study, each patient was a control to him or herself. In other words, the patients alternately received HD by both methods and, therefore, the intervening effects of confounding variables (such as body mass index, weight, gender, and the type of vascular access) were controlled. In order to ensure the reliability of the study findings, the same type of HD machine (dialog + evolution hemodialysis system, B. Braun Medical Inc., Melsungen, Germany) was used for all patients. The HD solution was 36 – 37°C sodium bicarbonate and the blood flow rate was set at 300 – 350 mL/min. Moreover, the same dialysis protocol was used for all patients. The content validity of the study data collection tool was assessed and confirmed by a panel of faculty members. The study data were analyzed by using the SPSS software (v. 20.0) (IBM Corp., Armonk, NY, USA) and through conducting the paired- and the independent-samples t tests. In total, 30 patients participated in this study, among whom 11 (36.6%) were female and 19 (63.3%) were male. Patients in each group received HD in 120 sessions, 240 sessions in total. The mean of participants’ age was 56.34 ± 16.75 years. The results of the paired-samples t tests illustrated no significant difference between the groups, regarding participants’ age (Table 1). The underlying etiologies of renal disorders of 90% of the patients were hypertension and diabetes mellitus. aNumber of hemodialysis sessions = 240.
bValues are expressed as mean (SD) unless otherwise indicated as No. (%). The paired-samples t test showed that there was a significant difference between the two HD, indicating that the adequacy of routine HD was significantly less than HD by using sodium and ultrafiltration profile (P < 0.05). This finding reflected the higher adequacy of profile-based HD, compared with the routine technique. Moreover, the independent-samples t test indicated that there was no significant difference between the groups, regarding the score of HD adequacy, denoting that the order of HD techniques has no significant effect on HD adequacy (Figure 1). The mean score of hemodialysis adequacy in the stepwise sodium and ultrafiltration profile technique is greater than the routine technique. The findings of the present study showed that, compared with the routine HD technique, stepwise sodium and ultrafiltration profile significantly enhanced HD adequacy. 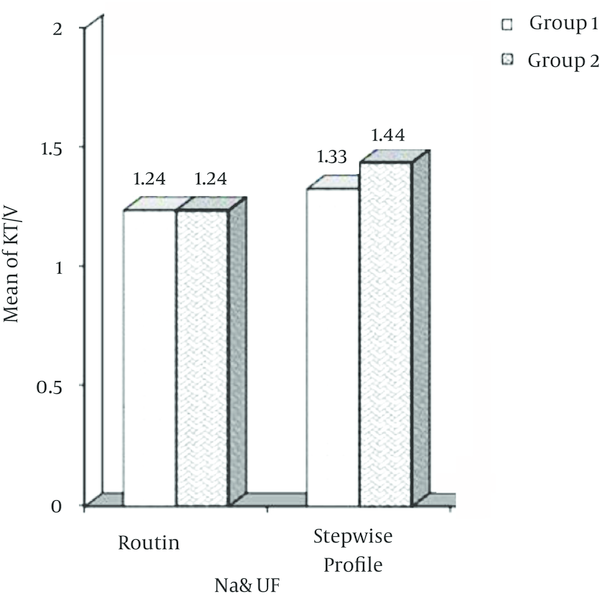 The mean of Kt/V in the routine technique was 1.237, while it was equal to 1.395 in the stepwise sodium and ultrafiltration profile technique. Song et al. (2005) studied 11 patients to compare the effects of different sodium and ultrafiltration profiles and concluded that stepwise sodium and ultrafiltration profiles prevented intradialytic hypotension, improved ultrafiltration and maintained the quality of HD. They also reported that in their control group, 18 HD sessions (54.5%) were complicated, while the number of complicated HD sessions in the stepwise sodium and ultrafiltration profile group was equal to nine (27.3%) (13). Zhou et al. (2006) investigated the effects of sodium and ultrafiltration profiles on hypotension and reported that these profiles significantly prevent alterations in the osmotic balance of body fluids and, hence, cause greater hemodynamic stability (12). Ghafourifard et al. (2010) also compared the effects of linear sodium and ultrafiltration profile, stepwise sodium and ultrafiltration profile and the routine hemodialysis technique on blood pressure variations, among 24 patients. They finally concluded that, as simple and inexpensive techniques, sodium and ultrafiltration profiles can maintain interdialytic hemodynamic stability (20). Tang et al. (2006) also examined the effects of linear sodium profile among 13 patients receiving HD. They found that this technique decreased the incidence of interdialytic hypotension by 62%, while having no significant effects on HD adequacy (21). Sodium and ultrafiltration profile significantly reduces the rate of intradialytic complications and enhances the quality of HD. In the absence of complications, HD is well tolerated by patients and its adequacy is increased. Consequently, the use of sodium and ultrafiltration profile is recommended for improving HD adequacy. Authors feel compelled to thank all who participated in the study as well as in the study setting who supported us during the study.